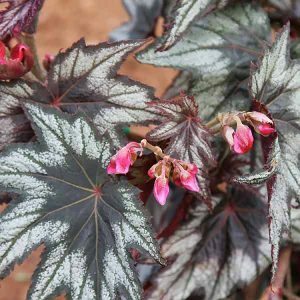 Shade loving, able to grow in dry conditions and a great ground cover plant, the rhizomatous Begonia has all of these qualities. In warmer climates they thrive, all that they need is a frost free situation and they can make a great ground cover plant. Good foliage and many with colourful flowers. They are easy care, and easy to propagate. As the name suggests they spread through the rhizomes. Although they are sub tropical plants they will grow well in temperate climates as long as you choose the right position. The foliage is the star of these plants, many with geometric patterns. They will flower as well, and with many hybrids available, we have great diversity. In cooler climates, grow them in containers, in warmer areas, grow them as an understory ground cover plant. The actual rhizomes of these begonias grow on top of the ground, they store moisture in the stems and rhizomes and this allows them to grow in dry conditions. In cultivation, they are often seen as indoor, or potted plants, however this really does depend on your climate. From Sydney to Queensland, they can be grown outdoors, in the ground. They only reach around 25 cm in height, often less and with great foliage are well worth a try in the right conditions. One of the main problems with Rhizomatous Begonias is over watering, especially with young plants. Soil – Best in humus rich, but very well drained soil. Fertiliser – Use a liquid fertiliser, however only during periods of active growth. Water well and then use the liquid fertiliser. Do not over water, do not over fertilise. These do not sound like a plant that requires a lot of pruning, however judicious pinching back after flowering will promote a bushier habit. Cuttings cane easily be propagated in a free draining propagation mix, use a mix of perlite and potting mix, or sand and potting mix. You can easily grow these begonias from leaf cuttings as well as by dividing the rhizomes.